Satori is the final doll in my Back to School Friends collection. 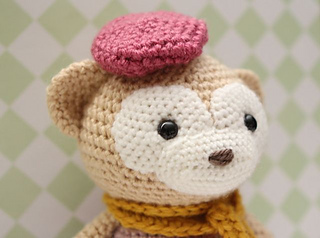 She is a stylish little monkey who loves to accessorize! For the first day of class, she chose a hot pink ruffled skirt and and a matching beret. 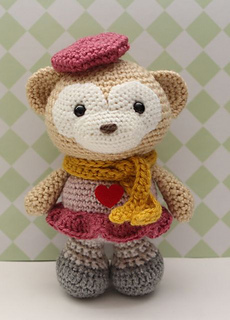 A cozy saffron colored scarf completes her look! Her favorite subject in school is Art and she cannot wait for a new year filled with fun times with her friends! Basic crochet knowledge is needed, as well as familiarity with making a magic ring, crocheting in rounds, increasing, and decreasing. The pattern is easy to follow and I welcome any questions and comments! The finished doll stands at 7.5 inches. 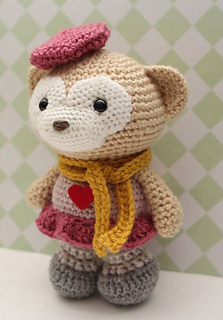 She is made with mostly worsted weight yarn and a G hook. 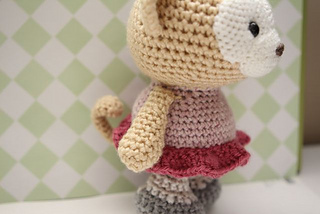 Her eye circles and snout are made with sport weight yarn and a D hook.